With the franchise sector in Ireland expected to grow over the next decade and the Irish economy itself predicted to expand by two per cent over the next 12 months, home improvements brand Granite Transformations is actively looking to recruit additional franchise owners across the Republic and Ulster, to take advantage of anticipated consumer demand. Growth in the economy should certainly trigger additional demand for home improvements, which enterprising franchise investors can help to meet with Granite Transformations’ kitchen and bathroom makeover solutions, forming the basis of a solid business with virtually unlimited potential. Homeowners looking to upgrade their current properties and add value, as well as those looking to venture into the housing market and enhance their homes’ selling features, are all potential customers for the Granite Transformations makeover proposition. However, this is no straightforward retail proposition; it also entails home selling, measuring up, fabrication and installation, eventually with a small team of salespersons and showroom hosts, craftsmen and fitters, although it could start small as a one or two man operation. It has already proved to be an ideal family business, with various members undertaking different roles, a lucrative start-up operation for a young or not quite so young couple, and a suitable enterprise for an energetic single person, able to build up a like-minded support team. Some sales or management experience, an eye for interior design, relevant technical capabilities and an appetite for hard work are all desirable qualities for a Granite Transformations franchise owner. Although the training and support mechanisms are firmly in place to fill any gaps in the CV and provide practical help en route to a successful franchised operation. The basic GT franchise model consists of retail premises, where the range of makeover materials is displayed; an adjacent or nearby workshop, where job materials are stored and fittings are fabricated; and a liveried van, which takes fitters to the customer’s home and carries all the necessary tools, sundries and materials. The most effective retail premises, in terms of attracting passing trade, tend to be high street showrooms and trading estate units, although on the UK mainland franchise owners have enjoyed considerable success with manned concession sites at garden centres and retail complexes, either as starter sites or as a platform for expanding into an adjoining territory. A typical Granite Transformations makeover job proceeds along the following lines: an initial customer website/telephone enquiry or showroom walk-in leads to a home visit, where measurements are taken, materials chosen by the householder and the paperwork is signed; the made-to-order worktops, cabinet doors and splashbacks are fabricated off-site, then brought to the customer’s home on the appointed day; the prefabricated worktops are overlaid onto existing work surfaces, doors and drawer fronts are removed and replaced with made-to-measure fittings, then kickboards, splashbacks and sink fittings are installed. In many cases, the entire makeover job takes just one day, which is yet another appealing aspect for customers. If selling is one of your personal skills that’s great; if not, any Granite Transformations franchise owner will tell you that the product virtually markets itself, so there is no pressure selling. 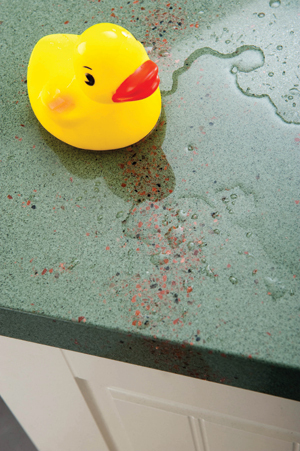 The core product USP is a tough, slimline, diamond-polished work surface material, which has all the luxury and appeal of natural granite, but is a composite made from either Italian granite, quartz, recycled glass or porcelain, which outperforms stone slab in strength, durability and general technical performance. Customers’ eyes do light up when they see product samples and weigh up how light and slender they are, appreciating immediately how Granite Transformations’ surfaces can be laid neatly and unobtrusively over existing worktops, without demolition, debris, dust and disruption. Granite Transformations and its franchise owners also enjoy the enormous commercial advantage that its work surfaces and other makeover materials are made by its parent company, the Trend Group. That means a steady stream of new colours, new materials, new technologies and new installation techniques that give a distinct competitive edge over other home improvement retailers and guarantee continuity of supply. Italian heritage glass mosaics, made by Trend for the international interiors market, have opened up the retail option of bathroom makeovers too, with mattress-based installation systems enabling laying beautiful glass tesserae over existing tiles, and GT franchise owners are now all Trend approved stockists. So, if the prospect appeals of an established franchise model with proven business growth potential, in an Irish home improvements market that is set to flourish once again, then check out Granite Transformations. There’s a choice of packages for those new to the market and existing kitchen and bathroom retailers, with franchise fees starting at a manageable €21,000 (£17,500) and independent advice on preparing a business plan and securing finance.